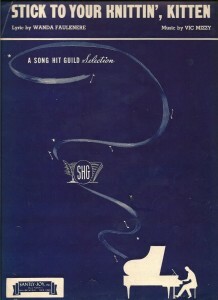 Tin Pan Alley and the federal government teamed up to produce war songs to inspire the American public to support the fight against the Axis, believing that the right music would be ‘vital to the war effort.’ This was headed by the Office of War Information, which believed that the right songs would be the ideal way to spread patriotic sentiments. 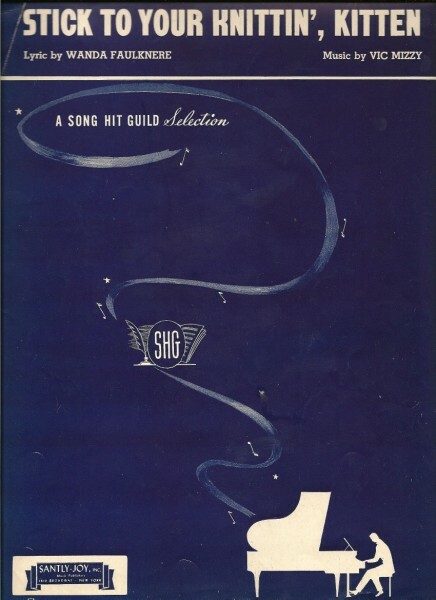 As with the songs from WWII, this music has been essentially ‘lost’ since the war’s end. 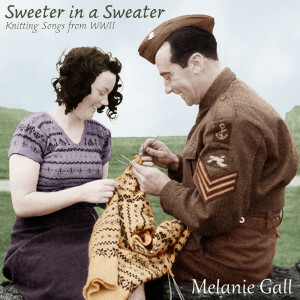 In the CD ‘Sweeter in a Sweater’, Melanie Gall is bringing back 15 of these fascinating pieces. In these and other knitting songs are reflected the joys, hopes and fears of the women on the homefront. Some cabarets present the music of ‘American Songbook’ greats like Irving Berlin and George Gershwin, and others feature Yiddish and German songs of 1930s Berlin. 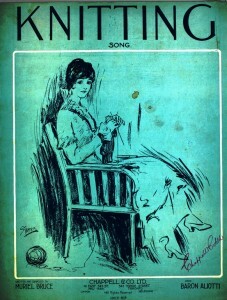 And some (well, just this one, actually) features the historic knitting songs of America. Yes, knitting songs. From the WWI novelty tune “Mamma’s Busy Knitting Little Mittens for the Navy (While Papa props his pants up with a pin)” to the WWII-era Glenn Miller ballad “Knit One, Pearl Two”, this music provides a unique slice of Americana, one that has been lost for over half a decade. 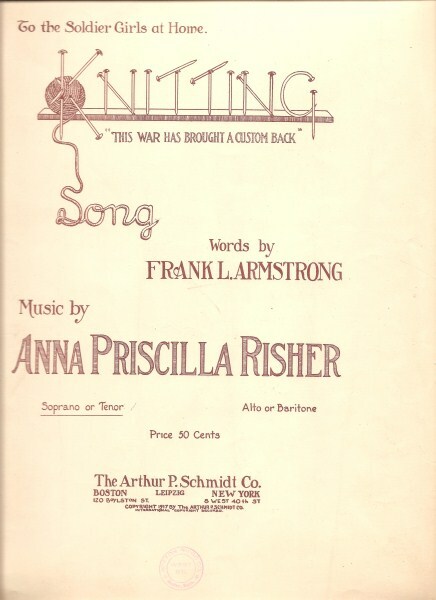 A hundred years ago the First World War broke out, changing history. Men who had never before left their hometowns were shipped overseas, to fight and die among strangers. For the first time in generations, the entire country banded together against a threatening force. 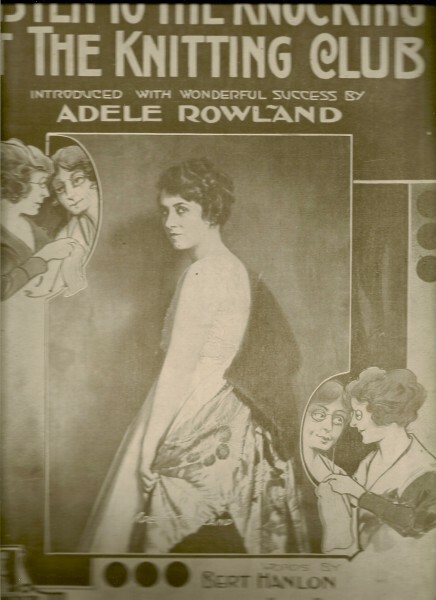 In 1917, when America entered the war, Mabel Boardman, the only female member of the Red Cross Central Commission, launched a campaign urging all American women to knit. 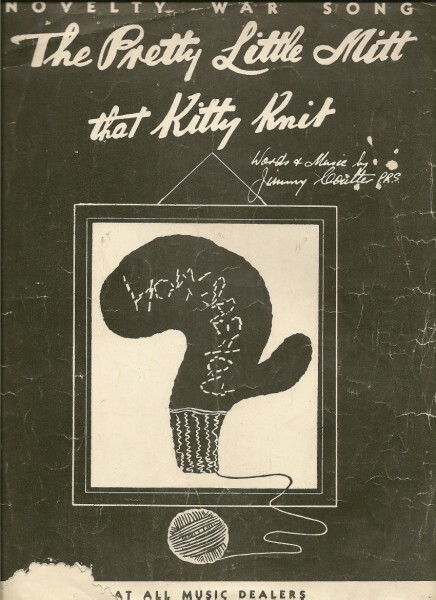 By the war’s end, over thirty million knitted garments had been produced. 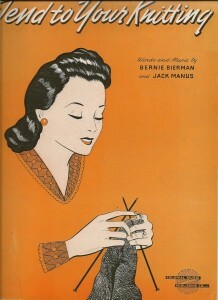 Everyone was knitting. Children, mothers, pretty young things, and even elderly women, who had knitted socks and hats for their fathers and brothers back in the Civil War, now knit vests and ‘stump socks’, for those soldiers whose limbs had been amputated or lost on the battlefield. Yarn mills started producing special ‘Water Repellent’ yarn in khaki and grey for the soldiers. 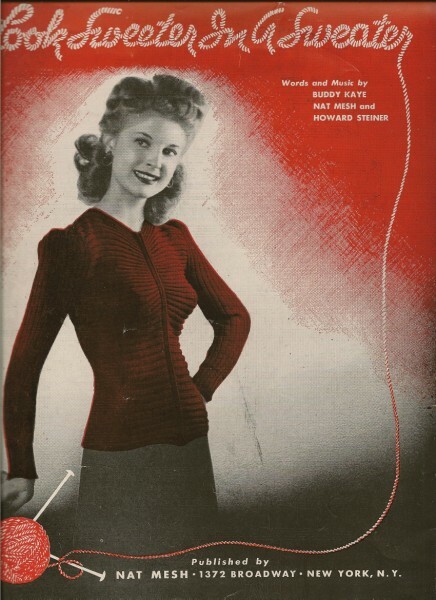 The values and struggles of wartime society were reflected in all of these knitting songs, and the songs, in turn, galvanized knitters to action. During the Second World War, there was once again a need for knitting. 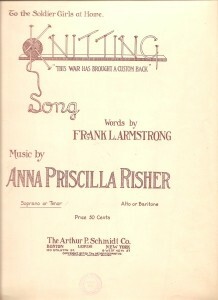 Tin Pan Alley and the federal government teamed up to produce war songs to inspire the American public, believing that the right music would be ‘vital to the war effort.’ These songs are significantly different in structure than those from WWI, however once again the personal stories of wartime knitters have been captured in this music. 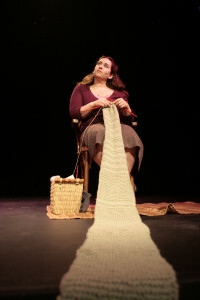 This unique cabaret melds historic stories, poetry and photographs, as well as letters from soldiers and the girls who worked at home to help the war effort, to give a funny, poignant and inspiring look at the music that ‘knit’ women on the homefront together. 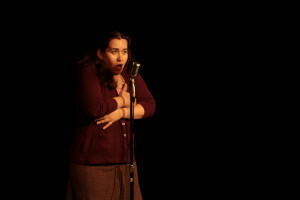 Written and performed by acclaimed soprano Melanie Gall. 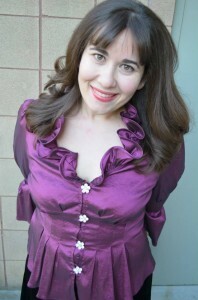 Melanie Gall is an internationally-acclaimed vocalist. 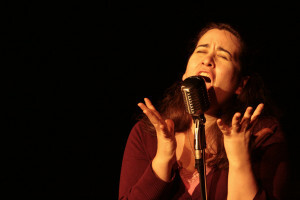 She has traveled to Africa, South America and the Caribbean to sing, and she is a regular performer at the American Spring Festival in the Czech Republic. Melanie’s opera roles have included Gilda, La Fée, The Queen of the Night and Lima Energelly in the North American premiere of the Hebrew Opera ‘And the Rat Laughs’. 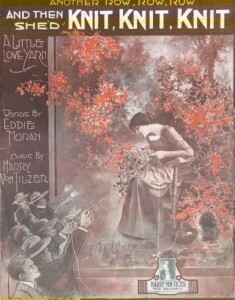 Melanie is based in New York City, and has sung at both Lincoln Center and Carnegie Hall. 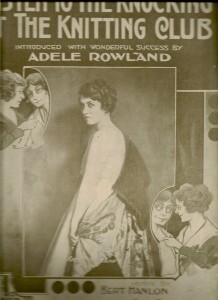 Melanie has written and toured several solo shows throughout Canada and the USA. 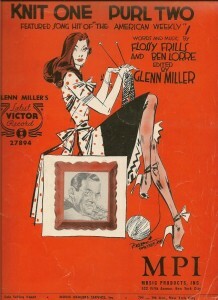 These include: ‘My Pal Izzy’, based on the early life of Irving Berlin, ‘The Sparrow and The Mouse: Creating the Music of Edith Piaf’, about French chanteuse Edith Piaf and her half-sister Simone, and ‘More Power to Your Knitting, Nell!’, featuring knitting music from WWI and WWII, and ‘The Fifty-Dollar-A-Night Girl’, all about woman Tin Pan Alley composers. 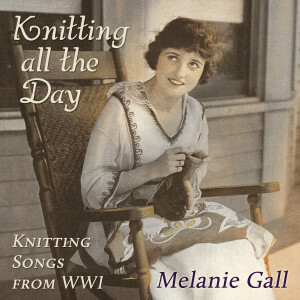 Melanie has 2 knitting CDs: Knitting All the Day, and Sweeter in a Sweater, both containing ‘lost’ historic knitting music. 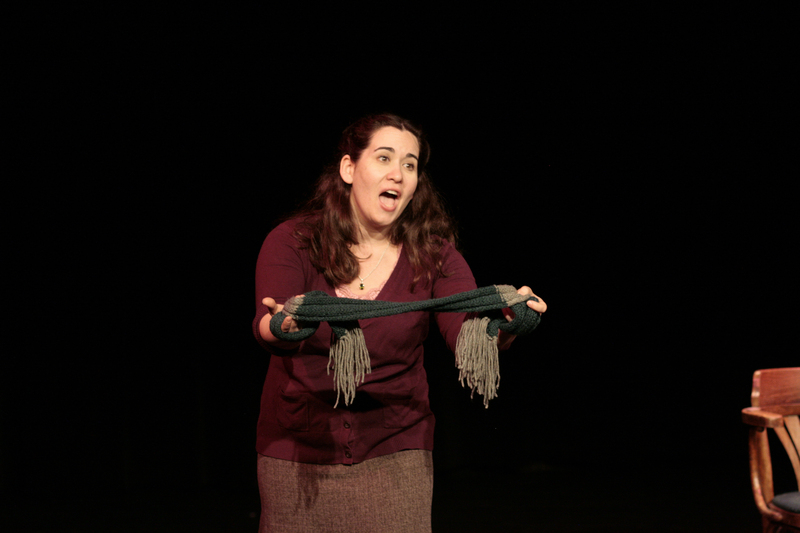 She sings and lectures about knitting music at colleges and theaters around the world.